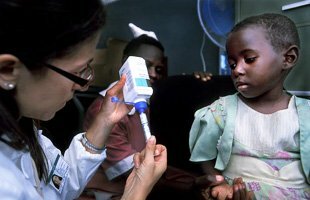 The UN’s latest assessment of global cases of HIV/AIDS shows there has been a further drop in new infections among children. There were 330,000 new infections in children last year – the figure is 24% lower than in 2009. But the report by UNAids also warns “significant additional effort is required” if broader targets to tackle HIV/Aids are to be achieved by 2015. The agency’s director said the pace of progress was speeding up. The number of new infections in adults has stayed broadly stable for the past four years – at about 2.5 million new cases a year. Many more people with HIV now receive life-saving drugs which keep the virus under control. But the report estimates seven million people who need treatment still do not have it. Sub-Saharan Africa remains the most severely affected part of the world, though some countries there have made impressive efforts in reducing fresh cases. The executive director of UNAids, Michel Sidibe, said: “Ethiopia, Malawi and Botswana have achieved big reductions in new infections, showing they are capable of controlling the epidemic. “Twenty-five countries have reduced the number of new infections by more than 50%. “In general, we’ve moved from a phase of political rhetoric to programmes being implemented and having an effect. The report also shows significant increases in AIDS-related deaths in Eastern Europe, Central Asia, the Middle East and North Africa. The report shows where challenges remain. For example, it says there needs to be a scaling up of efforts to offer circumcision to men, which trials have shown is effective in preventing some new infections. And it describes how “intensive efforts” are under way to find effective non-surgical approaches to circumcision – avoiding the need for scalpels or stitches – so that trained nurses could carry out the procedure rather than doctors.